Scientists at the Department of Energy’s SLAC National Accelerator Laboratory and Stanford University have discovered how graphene — a single layer of carbon atoms with great promise for future electronics — is superconducting in a graphene-calcium compound, meaning that graphene would carry electricity with 100 percent efficiency. While it’s been known for nearly a decade that this combined material is superconducting, the new study offers the first compelling evidence that the graphene layers are instrumental in this process, a discovery that could transform the engineering of materials for nanoscale electronic devices. The classic way to make graphene is by peeling atomically thin sheets from a block of graphite, a form of pure carbon that’s familiar as the lead in pencils. But scientists can also isolate these carbon sheets by chemically interweaving graphite with crystals of pure calcium. The result, known as calcium intercalated (layered) graphite or CaC6, consists of alternating one-atom-thick layers of graphene and calcium. For this study, samples of CaC6 were made at University College London and brought to SSRL for analysis. Researchers used a beam of intense ultraviolet light to look deep into the electronic structure of CaC6. The purity of the sample combined with the high quality of the ultraviolet light beam allowed them to see deep into the material and distinguish what the electrons in each layer were doing, revealing details of their behavior that had not been seen before. The researchers saw how electrons scatter back and forth between graphene and calcium, interact with natural vibrations in the material’s atomic structure, and pair up to conduct electricity without resistance. They reported their findings March 20 in Nature Communications (open access). These results set a solid foundation for future exploratory activities in the pursuit of fabricating superconducting graphene devices, the authors conclude. The work was supported by the DOE’s Office of Science, the Engineering and Physical Sciences Research Council of UK, and the Stanford Graduate Fellowship program. There is a great deal of fundamental and practical interest in the possibility of inducing superconductivity in a monolayer of graphene. 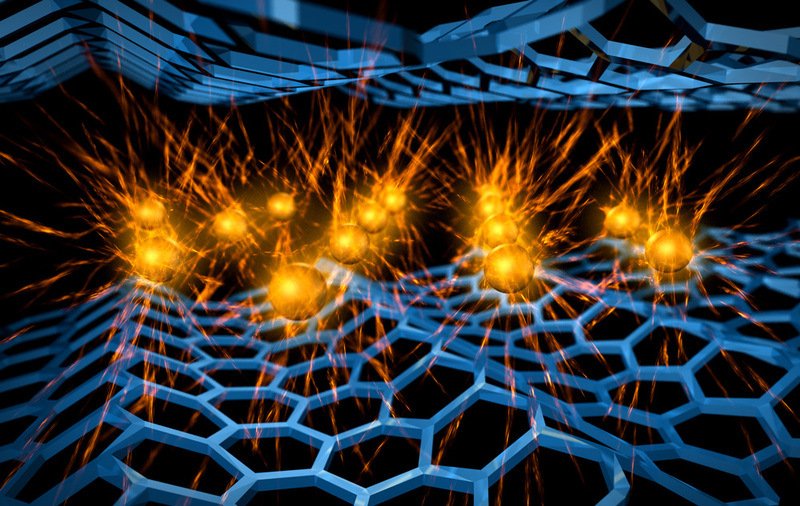 But while bulk graphite can be made to superconduct when certain metal atoms are intercalated between its graphene sheets, the same has not been achieved in a single layer. Moreover, there is a considerable debate about the precise mechanism of superconductivity in intercalated graphite. Here we report angle-resolved photoelectron spectroscopy measurements of the superconducting graphite intercalation compound CaC6 that distinctly resolve both its intercalant-derived interlayer band and its graphene-derived π* band. Our results indicate the opening of a superconducting gap in the π* band and reveal a substantial contribution to the total electron–phonon-coupling strength from the π*-interlayer interband interaction. Combined with theoretical predictions, these results provide a complete account for the superconducting mechanism in graphite intercalation compounds and lend support to the idea of realizing superconducting graphene by creating an adatom superlattice.